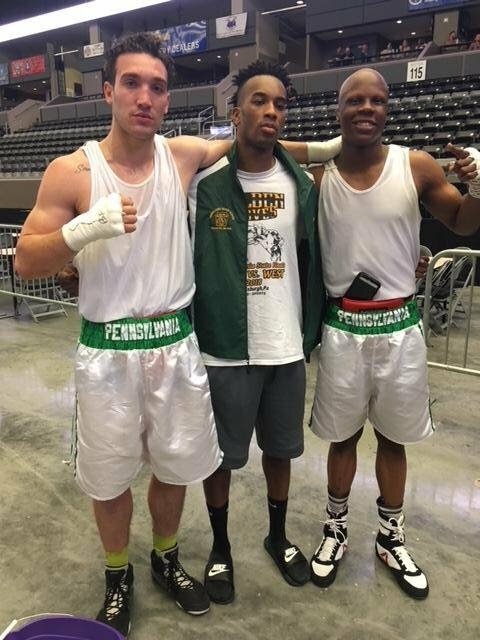 Philadelphia light heavyweight Atif Oberlton won his second National Golden Gloves championship in three years at the Tournament of Champions held at Ralston Arena last Saturday. Oberlton was one of two champions and three finalists for Pennsylvania, which finished second to New York Metro in the team standings. The 19-year-old Olberton, a West Philly native who boxes out of James Shuler’s Gym, won a unanimous decision over Miguel Teo of New England at 178 pounds. Kiante Irving of Beaver Falls became the first Western Pennsylvania fighter in 22 years to win a national championship. The 24-year-old middleweight defeated Anthony Campbell of Covington, Tenn., 3-2.
tournament at 203 pounds. Still, he knocked out Richard Baut of Nevada in his second bout of the tournament and beat former U.S. champion Nkosi Solomon by unanimous decision. Punxsutawney’s Becca Maine, a student at Penn State DuBois, was one of two boxers awarded $2,500 college scholarships by the National Organization of Golden Gloves Officials of America. She is the first female fighter to win the award. Maine reached the semifinals at 132 pounds before losing to Jennifer Lopez of New York Metro. Lola Cariello, the President of the Pennsylvania Golden Gloves, said the strong performance would have made her late husband Frank, the longtime director of the Pennsylvania Golden Gloves and the namesake of the state tournament, proud.